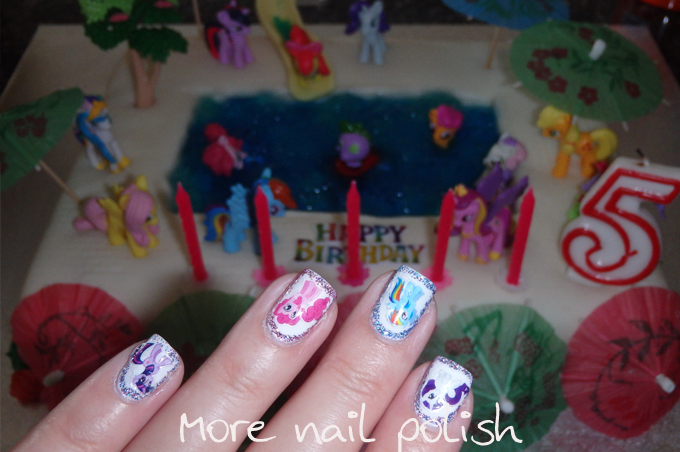 Quick post tonight to share photos of the nails I did for my daughters fifth birthday this last weekend. Firstly, can you believe that this little bubba is now five! I sure can't. You can see her growing each year, with my birthday mani, turning one, turning two, turning three and turning four! It's no surprise that we held a My Little Pony themed party, in fact we held a My Little Pony Pool Party and we had about 19 five year olds over all playing in the pool and on our waterslide. Here are the nails I did. 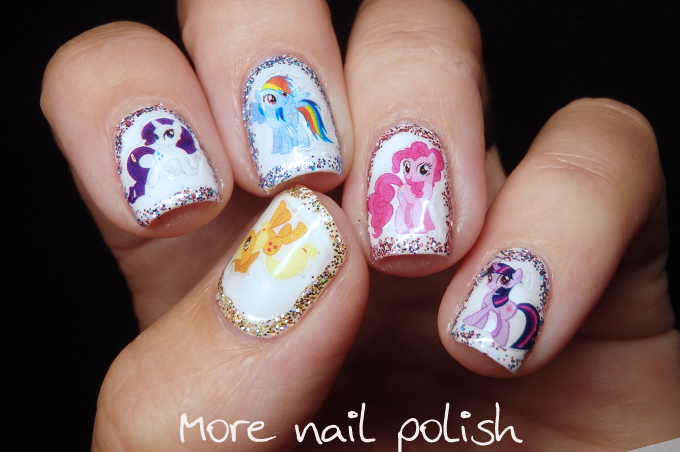 I used some My Little Pony nail stickers that she got from Christmas (yes, I'm that mother that stole her daughters nail stickers!) I have tried to do a mani for her using these, but they are thick and don't stick all that well, and therefore a ripe for picking for her little picky fingers. I used three layers of top coat to get all the edges stuck down nicely, plus I can control myself when there is a little bit sticking up. 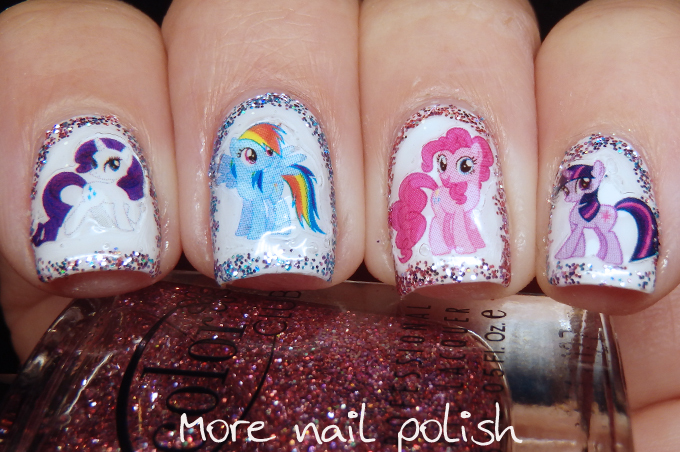 I had a different pony on each finger, framed with a different glitter from the Color Club Beyond the Mistletoe collection from 2012. I even took a photo of my Cinderella hand. Here is the birthday cake I made. 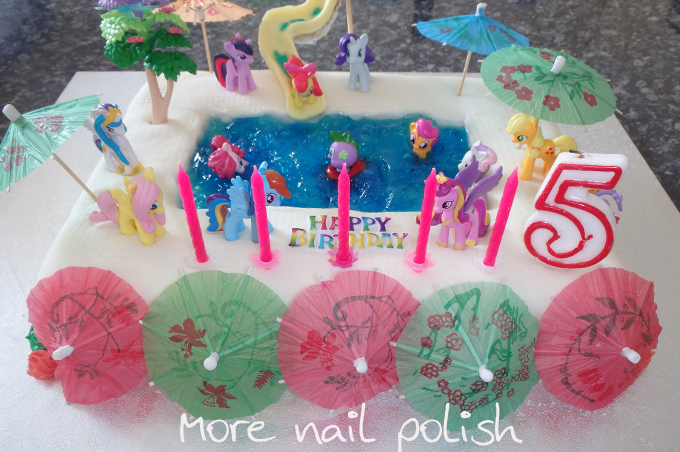 To match the My Little Pony Pool Party, of course I did a My Little Pony Pool cake. I remember having a swimming pool cake when I was about 5 or 6. 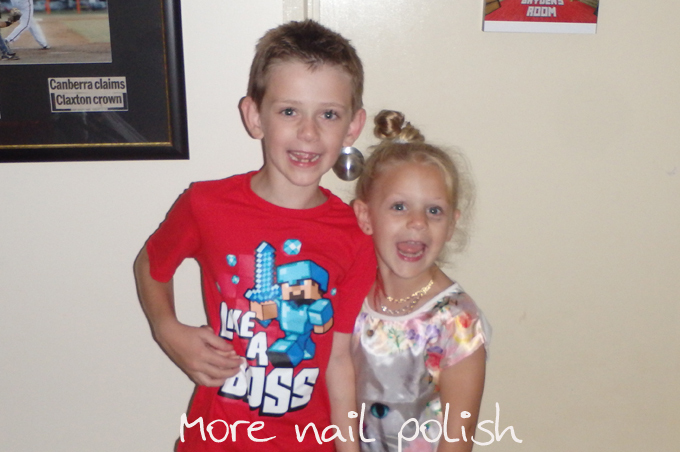 Here is a photo for blog posterity sake, Mr 7 and Miss 5. Where does the time go! And the obligatory, cake and nails shot! Congrats to little Miss 5! She is growing more and more beautiful every year. Happy birthday Ms 5! 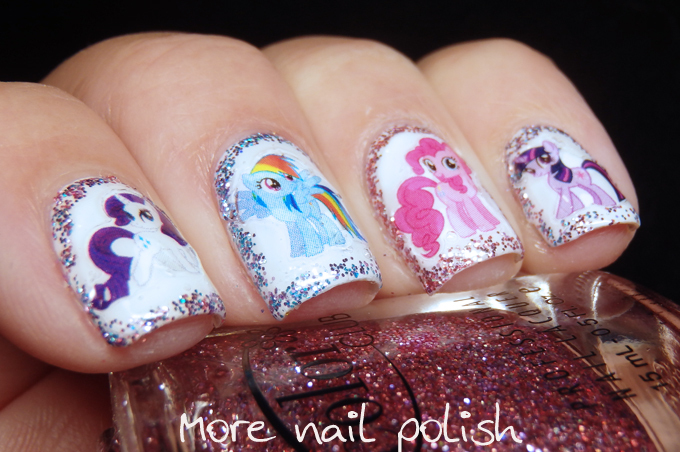 So cute :-) and I love the mani. Sooo cute! 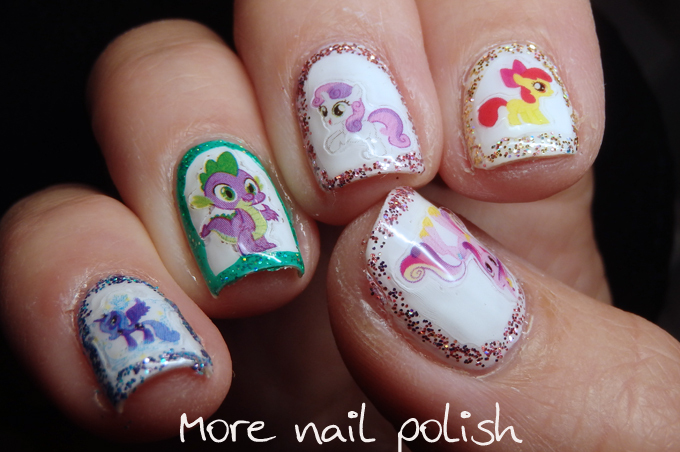 I can see an MLP birthday next year if my little Peanut's obsession continues the way it has been. Loooove the nails!!! Wow! Belated birthday wishes for a fun filled year! Lovely nails and awesome cake!